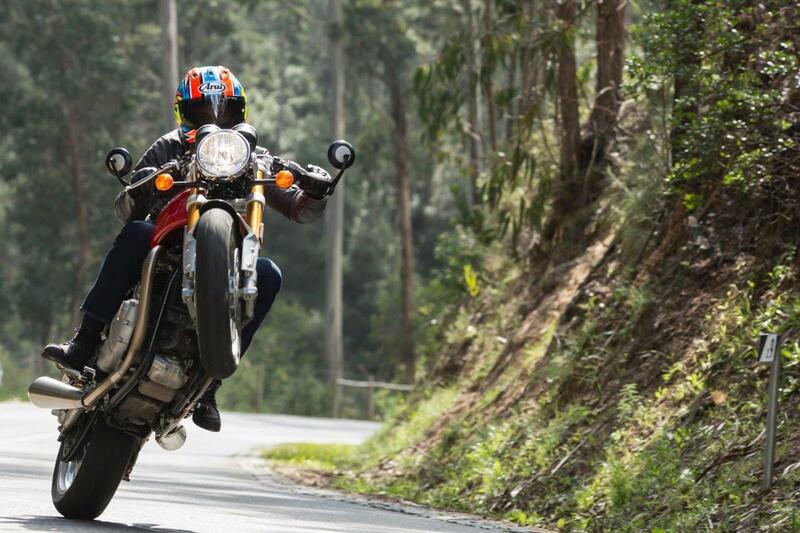 We’re riding Triumph’s Thruxton R at Brands Hatch next Wednesday, to see if it’s as impressive around a track as it is on the road. Of course, the hot new retro isn’t designed for the circuit, so our test is just a bit of fun, but with its Ohlins, Brembos, punchy twin-cylinder motor and sublime handling, it should be able to hold its own around the famous Kent track. If you’re in the area come and check the new Triumph out, or there are still spaces available on the MSVT trackday in both the day and evening sessions, if you fancy bringing your own bike along to ride (www.msvtrackdays.com). We’re taking Triumph’s Thruxton R to Brands Hatch next Wednesday, to see if it’s as impressive around a track as it is on the road. Of course, the new retro isn’t designed for the circuit, so this is just a bit of fun, but with its Ohlins, Brembos, punchy twin-cylinder motor and sublime handling, it should be able to hold its head up high around the famous Kent track. If you’re in the area come and check it out, or there are still spaces available on the MSVT trackday in both the day and evening sessions (www.msvtrackdays.com).